Another specialty of my brother in law, Q Longno....Looks really good! I bet taste yummy too! This is one of the Ilonggo Recipe we could be proud of. Boil pork and liver on a separate pot. Slice thin. Set aside. Fry chopped garlic till golden brown, set aside. Slice scallion thin, set aside. For the soup, boil bone marrow with onions, beef buillon, little brown sugar, ground black pepper and salt and taste. Also if you prefer you could dilute shrimp paste with water, strain and add the juice to the soup while boiling. Arrange cooked noddles on a bowl, add the sliced pork and liver. 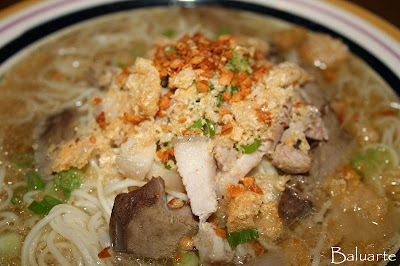 Add soup to it then garnish with crushed chicaron, browned garlic and thin slices of scalions.... Now you have Ilonggo Batchoy ala Q! 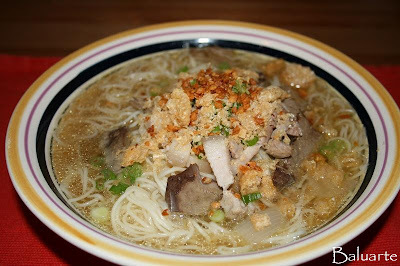 Batchoy ni Q looks comparatively with the ones posted in Flavours of Iloilo. 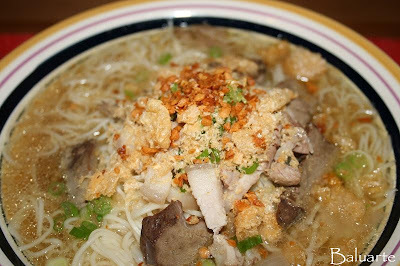 I'll wait for jorp tomorrow to taste La Paz batchoy at Deco's. tis the season for CALDO!!!!! thanks gid sang recipe, 'cil---kon kis-a ga ka ubos akon idea kon ano lutu-on!